So it all started with Pinterest. Actually, back that up, it all started with the thrift store by my house that sells great condition board books for 50 cents or less. 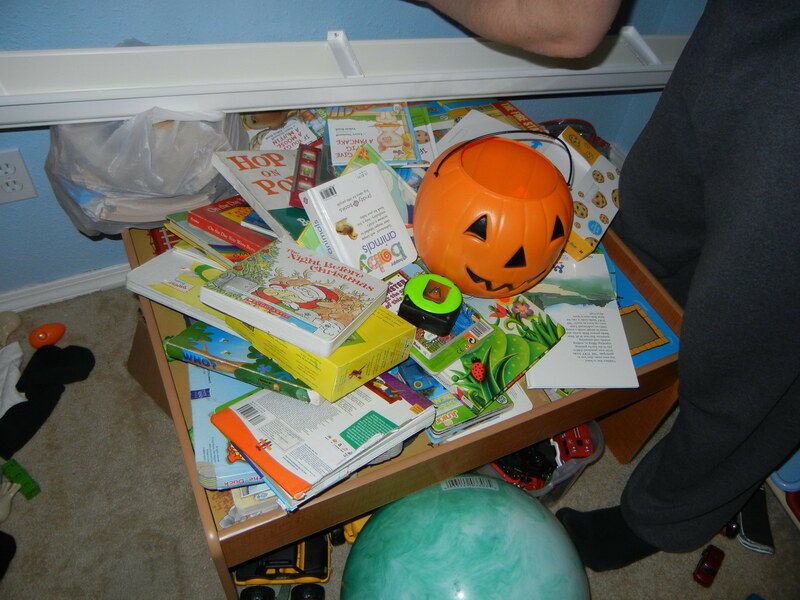 Due to the boys’ love of books, the books began to slowly take over the playroom, then the living room, then the kitchen, and the bathroom. I was constantly tripping over books. This is how our book collection was organized before the shelves. Piled up on the train table (without the gutter or measuring tape of course). Enter Pinterest. 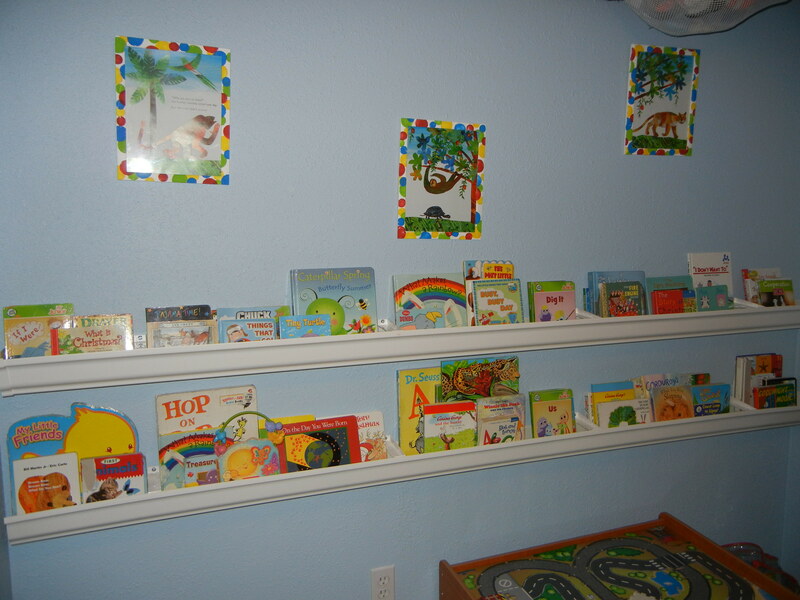 After searching for kids bookshelves I came to the conclusion that there are only two general types of kids bookshelves featured on Pinterest that would actually be reasonable in my tiny home: ikea spice rack bookshelves and rain gutter bookshelves. While I’m the first to admit that the ikea bookshelves with their “no assembly required” definitely catered more to my skill set, I hit one roadblock there: we don’t have an ikea locally, and they don’t sell them online. After consulting Google Maps and determining that it was a bit silly to drive 256 miles from my house to the nearest ikea, I started looking up tutorials for rain gutter bookshelves. The general consensus seemed to be the following: buy rain gutters, cut them to size, mount them to wall. Voila! Bookshelves. Okay, simple enough. I can do that. So I offer to you my very own tutorial: How to make super awesome rain gutter bookshelves without losing your mind (or a finger). Rain Gutters: (duh!) Gutters come in 10 foot lengths. We wanted wall to wall shelves, so we measured that wall. You can pick an arbitrary length or measure a wall of your own. Brackets: All of the other tutorials skimmed over this part so I was confused. Buy a bracket for every 2 feet of shelf that you want. If you don’t know what brackets are, it’s okay. They will be by the gutters, and neatly labeled. End Caps for the Gutters: In my opinion, if you are going to have your shelves run flush from wall to wall, these are optional because you wont have any sharp, rough edges exposed. However if you want shorter shelves, a more polished look, or if the guy at Lowe’s who helps you saw your gutters down to size wields the hacksaw like a drunken murderer, you’ll probably want to opt for the end caps. Dry Wall Anchors and Screws: Dry wall anchors are those plastic things that you shove into the wall before you put the screw in so that you don’t have to be bothered by doing things like finding studs. Make sure you don’t buy pegboard drywall anchors even if the package is a pretty yellow color and has the exact number of screws you need. They are not the same thing, which you will eventually discover and you may cry. A Drill: Remember to charge it before hand if it’s cordless. Sun Chips: We recommend Jalapeno Jack, but any flavor will do. 4. Arrive home and instruct your husband to unload the car. I feel like this should be an advertisement for these knives. 8. Use some sort of plastic on plastic glue to adhere the end caps to the gutters. We are Gorilla Glue kind of people around here. 11. Position the brackets where you want them (we did about 22 inches apart) and hold the gutter up to the wall where you want it. Use a level (really, do this, because what feels level is usually not, and you want a bookshelf, not a slide) and mark where you want the screws in the brackets to go on the wall. (Optional: Forget to grab a pen a silently curse your husband for taking the longest time to go get one while you hold the gutter, trying not to let it budge a millimeter before you mark it. 12. Optional: Eat some sun chips. 14. 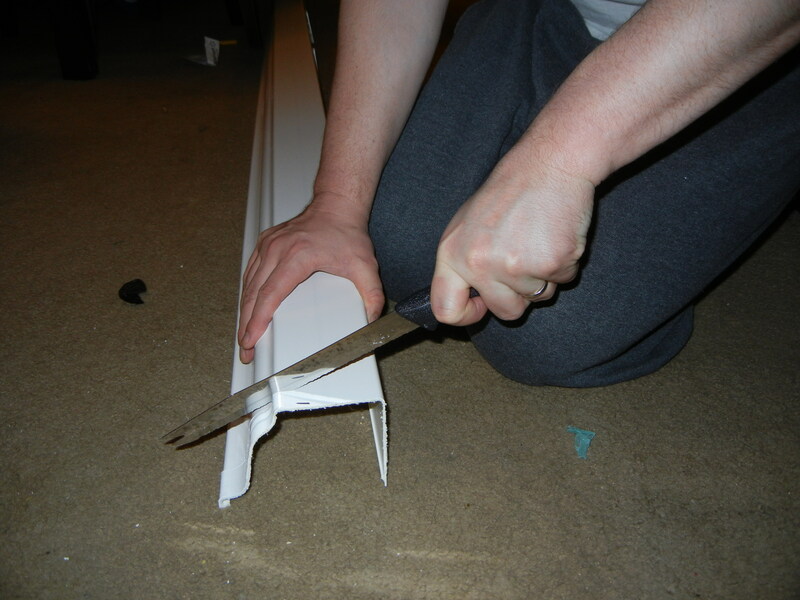 Hold the gutter in place while your husband uses the drill to screw the brackets into the drywall anchors. Load with books and admire. And that’s it. Bookshelves from rain gutters. Who would have thought? More of a pain than ikea spice racks, probably. However, I just love the way they look. If you leave your email address here you can have my random thoughts spewed directly into your inbox. Don't be scared of the spewing thoughts. I promise, it's not as gross as it sounds.